PARIS, April 14 (Xinhua) -- In a punishment operation over an alleged chemical weapon attack, French President Emmanuel Macron ordered a military intervention in Syria in coordination with the United States and Britain, a decision that drew support but also criticism at home. Ending days of speculation over an imminent use of force against Syrian regime, Macron gave the green light to the French military to join the operation targeting "clandestine chemical arsenal" in Syria. "We cannot tolerate the normalisation of the use of chemical weapon," he said after having repeatedly warned to use force in response to fatal chemical attack in the war-torn country if proved. 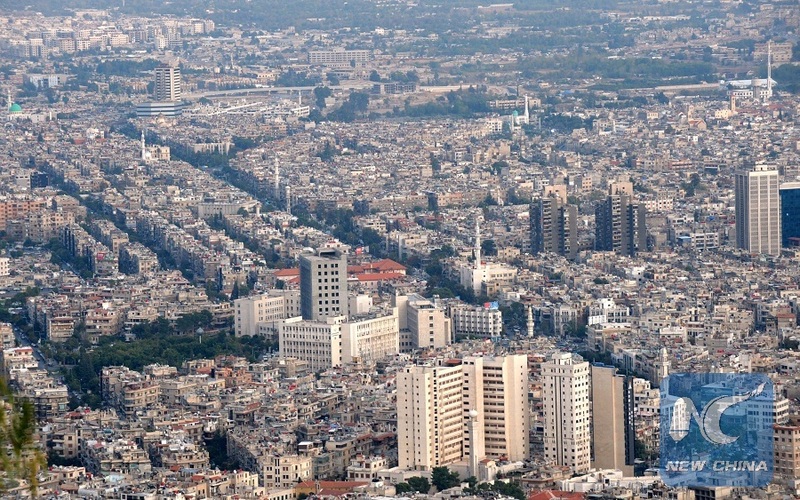 Released by the Quai d'Orsay hours after the strikes, a report based on technical analyses of open source information and declassified intelligence document noted "...beyond possible doubt, a chemical attack was carried out against civilians at Douma on 7 April 2018, and that there is no other plausible scenario than that of an attack by Syrian armed forces as part of a wider offensive in the Eastern Ghouta enclave." To his supporters, the 40-year-old president's first major military intervention since taking office a year ago was legitimate to defend the international laws. "This action is legitimate and directly aligned with the principles of the United Nations," said Amelie de Montchalin, centrist lawmaker. "In 2013, there had already been a previous use of chemical weapons and a UN resolution adopted then said if Syria started again (using prohibited toxic gas), the UN would okay an armed intervention. So we are in the continuity of the respect of the international law's principles," she told France info radio. On his tweeter account, conservative politician Xavier Bertrand hailed France's "right answer" to the use of chemical arms. "Let's welcome the commitment and professionalism of our armed forces," he wrote. The same support was expressed by the Socialist leader Olivier Faure. According to him, "the repeated chemical attacks of Damascus regime against its people imposed a reaction." "It is urgent that new discussions take place within the framework of the United Nations," he said in a statement. Defense Minister Florence Parly unveiled earlier on Saturday that cruise missiles fired from several air bases in France and naval means have been deployed to strike the research center and two production sites. In an interview with news channel BFMTV, Foreign Minister Jean-Yves Le Drian said that operation's "objective is reached", warning that further strikes could be planned if the Syrian government would cross the chemical weapons red line. However, Macron's move to defend France's grandeur triggered concerns of igniting tension in the region. "Adding war to war has never brought peace. This show of force risks fueling terrorism. It feeds the idea that the West is hostile to the Arab world. These strikes weaken our diplomacy," tweeted Bruno Retailleau, president of right-wing "The Republicans" group at the senate. Jean-Luc Melenchon, one of Macron's old rivals in the 2017 presidential race, called the operation "a matter of North American revenge, an irresponsible escalation." "The strikes against Syria are without proof, without a UN mandate, and against it, without a European agreement and without a vote of the French Parliament," Melenchon said on Twitter. "France deserves better than this role. It must be the strength of the international order and peace," said the leader of the far-left party La France Insoumise. For her turn, far-rightist leader Marine le Pen expressed concerns over "unpredictable consequences" of the strikes. "These strikes against Syria engage us in a way with unpredictable and potentially dramatic consequences," she said, noting that France lost "an opportunity to appear in the international scene as an independent power."